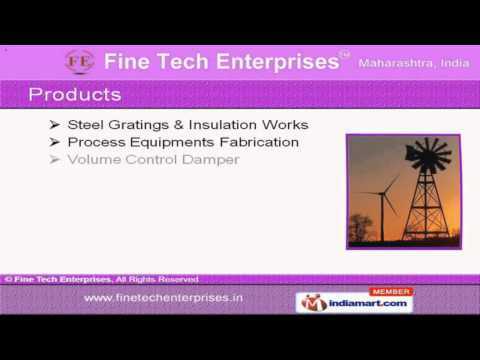 Welcome to fine tech enterprises manufacturer & supplier of heat exchangers, process equipment & insulation works, we are an ISO 9001:2008 certified company, established in 2004 at pune. Our state-of-the-art manufacturing unit & client focused approach have helped us to gain clients across the globe. Assured quality, excellent pre delivery inspection, competitive prices, timeliness & spacious warehousing have helped us to earn clientele like praj industries ltd & thermax limited. Our products list includes steel gratings, insulation works, process equipments fabrication, volume control dampers, heat exchanger & exhaust systems. We provide steel gratings & insulation works that are widely acclaimed in the market. Our process equipments fabrication like boiler parts, butterfly dampers, insulated panels & pumps base frames are a class apart. Along with that we provide heat exchangers that are well known for their impeccable performance. We also offer fume exhaust systems at market leading prices. S. S & ms boiler parts fabrication are some of our best selling products.